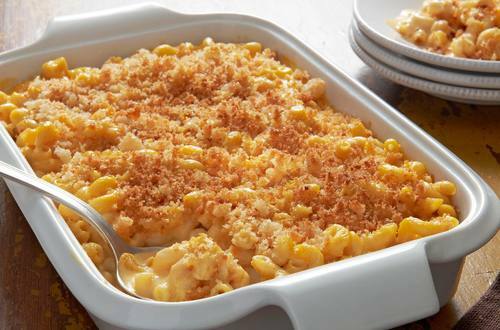 "Great Vegan Mac & ""Cheese"" | Hellmann's US"
1 Preheat oven to 350°. Prepare macaroni according to package directions. 2 Meanwhile bring 2 cups water, potato, onion, carrot and garlic to a boil in medium saucepan over high heat. Reduce heat and cook until tender, about 15 minutes. Remove and reserve 3/4 cup cooking water, then drain. 3 Transfer vegetable mixture and reserved cooking water to blender and blend until smooth. (Or puree in pot using a hand held immersion blender.) Reserve 1 tablespoon Hellmann’s® or Best Foods® Vegan Carefully Crafted Dressing and Sandwich Spread. Add remaining to blender; add dry mustard and blend until smooth. 4 Combine drained macaroni and sauce in pasta pot; season, if desired, with salt and pepper. Transfer to 8 x 8-inch baking dish. Combine reserved 1 Tbsp. Dressing and Sandwich Spread with panko crumbs and sprinkle over top. 5 Bake 15 minutes or until crumbs are toasted.